Hello and welcome to our live coverage of stage 4 of the Volta a Catalunya. Today's stage is another mountain stage in the Pyrenees, running 150km from Llanars to La Molina. The peloton will be starting the neutralised section at the start of the stage soon. Three first category climbs are on the menu today. We have the Coll de Coubet at 39km, and then the finishing ascent to La Molina will be climbed twice from different sides – first at 125.7km and then to the finish. The Port de la Creueta is the only hors categorie climb of the day. It's the second climb on the route and comes after 92.6km. Egan Bernal was one of the riders of the day yesterday. The young Colombian blew up the lead group with his attack on the final climb, before a lack of cooperation up front saw Adam Yates, Dan Martin and Miguel Ángel López catch up. Read our story on the young rider classification leader here. Bernal, who lies third overall, will be up there again today. We should see the same riders competing for the win and probably the race lead if Thomas De Gendt can be shaken off. Yates, Bernal, Martin, Quintana and López are separated by just 12 seconds on GC, while De Gendt lies 27 seconds up on second-placed Yates. Nathan Haas (Katusha-Alpecin) and Alan Banaszek (Caja Rural-Seguros RGA) didn't finish yesterday's stage and so won't race today. Xandro Meurisse (Wanty-Groupe Gobert) is the other non-starter for stage 4. Łukasz Owsian (CCC Team) is among the early attackers, along with three other riders. Here's the latest in our transfer mechanics series. A huge number of riders are on the market this season, with big names like Julian Alaphilippe, Nairo Quintana, Vincenzo Nibali, Dan Martin and Mikel Landa all out of contract this season. Click here to read all the latest from Dan Benson. Back to the race and four men are on the attack, with a small advantage over the peloton. They are Will Clarke (Trek-Segafredo), Sander Armée (Lotto-Soudal), Łukasz Owsian (CCC Team) and Brice Feillu (Arkéa-Samsic). And the break has been caught. The peloton are in the valley before the first climb of the day. The riders are starting the Coll de Coubet now. The climb is 9.2km long at an average of 5.5% and a maximum gradient of 11%. The peloton is still all together on the climb. Still no successful breakaway yet. The riders are on the Coll de Coubet. The peloton have crested the top of the climb. News on who picked up the points is upcoming. Unsurprisingly it's De Gendt who led the way over the top of the Coubet, picking up another ten mountain points. Simon Yates and Peter Weening were next across the line. 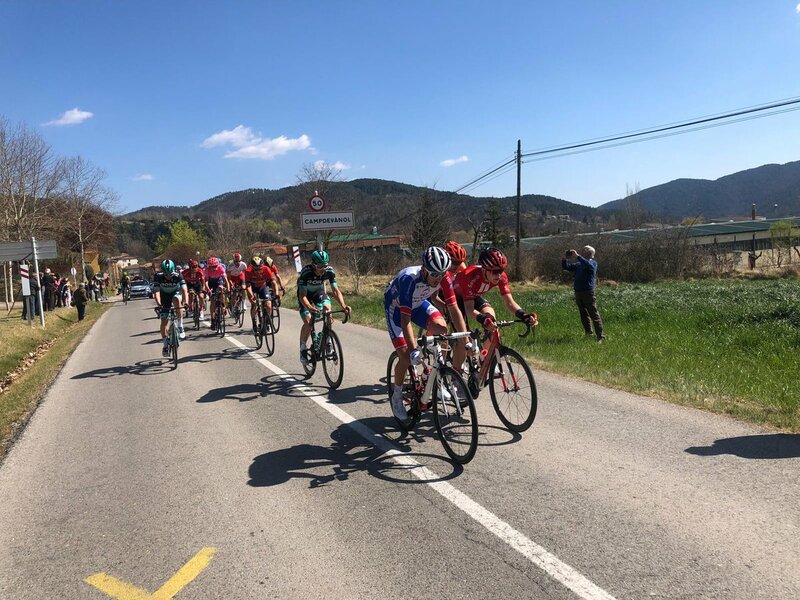 The peloton head downhill now, towards the first intermediate sprint of the day at Ripoll. A large group of around 25 men has gone clear on the descent from the Coll de Coubet. They're over three minutes up on the peloton. Matthews led Schachmann and Knox over the intermediate sprint. They break are 3:15 up on the peloton. Knox is the best-placed man in the break, 2:14 down on De Gendt. Ciccone is at 2:28, Schachmann is at 2:28, Martin is at 2:38, Dombrowski is at 2:54 and Soler is at 2:56. The rest of the break are over three minutes down on GC. The gap remains at around 3:15 with 87km to race. Gonzalo Serrano (Caja Rural-Seguros RGA) and Simon Špilak (Katusha-Alpecin) have abandoned the race. Rémy Mertz (Lotto-Soudal) has also left the race. The riders are climbing again now, on the second climb of the day, the Port de la Crueuta. That HC climb is 19.9km long at an average of 4.7%. Photo from @VoltaCatalunya. The break is being thinned out on the climb. The climb of the Port de la Crueuta has featured in 2014, 2015 and 2018, all on stages ending at La Molina. The final climb itself has featured each year since 2014. Joaquim Rodríguez, Tejay Van Garderen, Dan Martin and Alejandro Valverde (twice) have triumphed on La Molina during that time. Usually the gaps aren't too big up there, with around 20 seconds separating first from tenth. Last year though, over a minute separated the top ten after Movistar dominated the climb. Here's a shot of Valverde beating Bernal last year. The lead group has reportedly been slimmed down to just nine riders now. They're still on the climb. The weather is good out on course today, as it has been all week. Sunny and breezy. Sky are leading the peloton at the moment. They're five minutes behind the break. Not sure who is left up front from the breakaway at the moment. An educated guess would point to the likes of Caruso, Ciccone, Carthy, Dombrowski, Navarro, Verona, Soler, Schachmann, Reichenbach and Martin though. Verona and Mühlberger are up front now. Chris Froome leads the peloton. The gap back to the peloton is 3:20. Bevin is up there with Mühlberger and Verona. The lead trio pass through the feed zone just after the summit. UAE Team Emirates are leading the peloton now, with Sky just behind. Dan Martin is a contender to repeat his 2016 stage victory later today. 22km to go over at the Women's WorldTour race Driedaagse Brugge-De Panne. Follow live here. Live pictures are coming up soon so the updates will be coming more frequently. The peloton is 3:30 down on the leaders at the moment. There's a minute between Verona, Mühlberger, Bevin and the remainder of the breakaway. The break is on the first of two climbs to La Molina. The peloton are climbing too. They're approaching the summit from the south, before descending into Alp for the intermediate sprint and then climbing to the finish from the north. UAE and Sky are still combined at the front of the peloton. Ciccone, Schachmann, Martin, Soler and Gallopin are 20 seconds down on the lead trio. The front two groups have merged now. Dombrowski and Grmay are up there too. Bizkarra is also up there. Attacks fly up front as Soler and Mühlberger go. Bizkarra ups the pace in the chase group. They're 30 seconds down on the lead duo. Soler and Mühlberger are, strangely, on the short downhill to the king of the mountains point. Four Sky men, including Bernal, are on the front of the peloton. Back uphill again for the lead duo. Gallopin and Martin aren't with the chase group. Unclear if they're up the road or have been dropped. Riders seem to be coming and going by the minute. Navarro is up with the chase group now. The break rides through La Molina for the first time and crosses the summit. Downhill to Alp and the final intermediate sprint now. And the leaders are about to start the climb back to La Molina. The chasers are 1:55 back, the peloton a further minute behind. Won't be too long until the chase group is swept up by the peloton. Soler led Mühlberger through the intermediate sprint in Alp. They're climbing again now. The peloton is just 20 seconds down on the chase group now. Jumbo-Visma and UAE Team Emirates lead the peloton as they close in on the chase group. This ascent of La Molina is 12.1km long at an average of 4.7%. That average is reduced somewhat by the short descent near the top of the climb, however. De Gendt is dropped from the peloton. The climb is steepest at the bottom, with gradients of 11-12% in places. There are double-digit gradients on the final kick up to the finish too. The peloton has really shrunk on the early slopes. The main GC guys, De Gendt aside, are still there. The group is 2:10 down on the leaders. Sosa and Sivakov are still there for Bernal. Around 15-20 men in the GC group now. Zakarin, Pinot and Carapaz are out the back of the GC group. Maybe around 10 riders left in the GC group now. López flies away from the peloton. Porte and Mas are struggling to keep contact at the reare of the GC group. López just ten seconds up on the GC men. Mas has lost contact with the GC group. Kelderman and Porte have been dropped too. Bernal, Quintana and Yates have caught López. Group of four up front now, a minute behind the leaders. Bernal is driving it on. Remnants of the break are being hoovered up, Guillaume Martin the latest. He latches on to López. 30 seconds between the leaders and López. Simon Yates and Kruijswijk leave their group behind to join Bernal and Quintana. So a group of five, including the Yates brothers, chasing down López now. 5km to go for the leaders. López is 20 seconds down. The double Yates group 40 seconds down. Simon Yates goes to work at the front of the chase group. López is virtual leader, 10 seconds up on Adam Yates. López leaves Martin behind now. He's close to the lead duo. López catches Soler and Mühlberger. Martin is in no-man's land between the two groups. 20 seconds between the Yates-Bernal group and López. The Dan Martin group is closing in. Adam Yates and Bernal attack from the chase group. Bernal and Yates are together now. Quintana and co had no answer to that attack. Short descent now. López flying down the descent. 15 seconds between the first two groups. 40 back to the Dan Martin group. No time check to Quintana. Final kilometre now for López! Mühlberger struggling to keep up. Great job by Soler so far though. Bernal and Yates are 20 seconds down. Back uphill for López now. Quintana, Kruijswijk and Martin are closing in on Bernal and Yates. López drops Soler with 600 metres to go! Quintana drops Kruijswijk to bridge up to Yates and Bernal! Kruijswijk makes it up too! Four chasing with Soler and Mühlberger in between. 25 second gap. López takes the win solo! Mühlberger and Soler take second and third, around 17 seconds down. Bernal and Yates are right there with them. Kruijswijk and Quintana come in a few seconds later. Martin takes eighth, at 33 seconds. Woods leads the rest of the GC men over at around 40 seconds down. Second win of the season for Superman López. He won Colombia 2.1 in February. The Zakarin and Pinot group come in almost two minutes down. López is the new race leader, while Yates and Bernal will remain in second and third. López will benefit from the 10 bonus seconds too, and the breakaway men taking 6 and 4 away from Bernal and Yates. Here's a shot from the moment of López's attack today. "It's good that the team works very hard today. They always worked, covering me and being very aware of me. It was very important and today we had a good feeling. Today I had the legs to attack. "The fight will continue, and I think I am in a good condition. The important thing is that tomorrow is a little calmer, and we will recover a little and fight until the last day for sure." Here's today's winner crossing the line at La Molina. López delivered Astana's 20th win of the season today. That's it for us today. Join us again tomorrow for live coverage of stage 5, a likely sprint stage from Puigcerda to Sant Cugat del Valles.